I'm not a person to shy away from colour, and think that every room of our house should allow the personalities and loves of the people in them to come out. I love colour - I love different colours - And I love mixing colours to suit us. I totally not a white and magnolia fan! So when my husband finally gave me the go ahead to start stripping the living room, I got that paper off as fast as I could and started planning what our living room would look like. 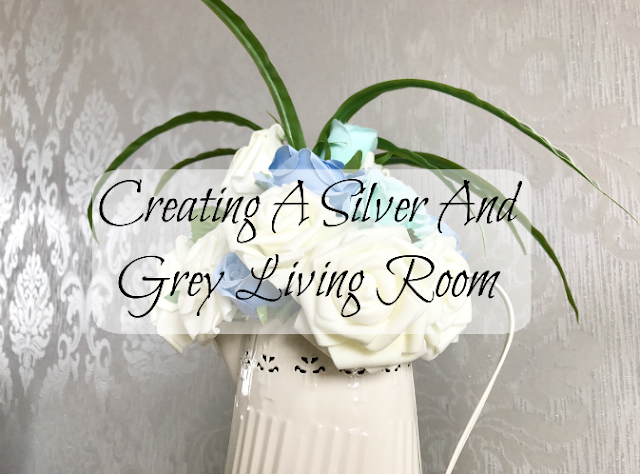 I knew that I wanted a silver theme, and grey seemed to be an 'in' colour at the moment, and that's where my choice came from. Now okay, our room isn't totally finished yet. There is the slight matter of the patio doors that don't work - well, they do open, but then the door falls off - and so we've been looking at bi-fold doors that will give us our complete room, and help to bring the outside in as we can fling them open and be at one with the elements whenever we like. I always find that it's good to give yourself a base to work from, so went in search of the wall colour and designs first. I mean, once I've got that base, it's much easier to organise and design the rest of the room and accessories. The reason I had put off doing up our living room for so long, was because I just couldn't find the wallpaper that I had thought of in my head. But after much searching, I found the paper of my dreams, the Henderson Interiors Chelsea Glitter Damask paper in soft grey and silver. This just called out my name as I scrolled past. I just knew that this was the perfect wallpaper for our living room so I ordered a sample and waited for it to arrive, to make sure that it was as lovely in person as it looked online. It was stunning and so that was it, I was now going to design a grey and silver living room. I then popped down to Wilko's and bought a few of their tester paint pots in similar grey colours and tried out each one against the paper. I try to use Wilko paint most of the time as it seems really good quality - or that is what my decorator husband tells me anyway! This resulted in me choosing the Wilko Pearl Grey Silk Emulsion as the one that matched closely to the wallpaper. It was then a case of searching high and low for accessories to complete the room. I found the most perfect curtains and rug on Amazon of all places, which gave the room that gorgeous fabric detail, and texture of a very fluffy rug floor. We then picked out a carpet at our local carpet fitters to give our living room a nice cosy feel. We did toy with the idea of laminate, or even tiles, but decided to stick with a carpet to keep the room warm whilst also making it easier to cleaner as I can just whizz a vacuum cleaner around whenever the kids drop crumbs! I then finished the room off with some stunning new light fittings. The Beaded Global Pendant injects Moroccan-inspired design into our living space and is from Wilko. One for each end of the room - they just give that extra touch of luxury and look amazing against the grey background. Although my husband would argue against these since he headbutts them all the time! Finishing with some ornaments to really make the room pop, I bought some Moroccan candle lanterns, which have never been used in all honesty, and I added some artificial flowers to give a hint of blue to the room and a floral aspect. The wall decor were last minute buys - a gorgeous vintage designed clock from eBay and pictures from Etsy to make the room complete. Love the way the wallpaper bounces the light around the room - will be spectacular at night with the light one ! l adore that lampshade its amazing bet it looks lovely lit up! The wallpaper is fabulous, it's amazing how just one wall can define an entire room. Copyright At Home With Kayla 2019. Simple theme. Powered by Blogger.